Chiropractic is a natural and conservative form of health care, offering an alternative to many conditions to medication and surgery. It is the third largest primary health care profession in the world after medicine and dentistry. The term primary health care professional means that we carry out both diagnosis and treatment, so you do not need to be referred by your medical doctor. A chiropractor is trained to diagnose your problem and will refer you to another healthcare practitioner if necessary. The main focus of our treatment is the relationship between the function of joints, muscles and the nervous system (neuro-musculo-skeletal disorders) and the effects of these disorders on health. Working on all the joints of the body, concentrating particularly on the spine, we use our hands to make gentle, specific adjustments (or manipulation) to reduce pain, improve body function and to allow the body's natural healing ability to function at its best. However, we are also trained to assess and treat other joint and health problems (see Conditions we Treat). The principal treatment is joint adjustment or manipulation and we are trained in many different techniques, which enable us to select a treatment method that is suitable for you, making the treatment safe and effective for all ages. 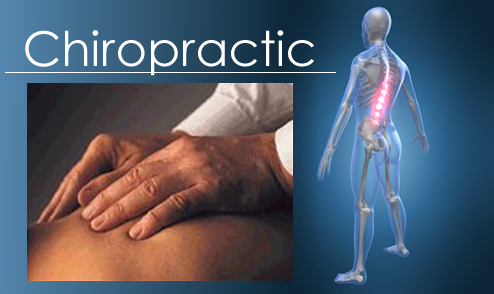 However, chiropractic treatment does not only involve spinal manipulation - far from it. Management also includes; rehabilitative exercises, patient education and lifestyle modification, diet and nutrition, the use of physical therapy modalities, soft tissue techniques (Trigger Point Therapy and/or Dry Neeling), and the use of orthotics and other supports when necessary. There is also an emphasis on health promotion and early return to normal activities. The focus on education and patient empowerment is an important factor in the success of the treatment. The strengths of chiropractic have always been its effectiveness, strong research base and high patient satisfaction. Chiropractic brings relief to thousands of people around the world who would otherwise suffer prolonged pain or illness. WHY DO CHIROPRACTORS PERFORM ADJUSTMENTS? Describing the very first Chiropractic adjustment in 1895 the founder of Chiropractic, Daniel D. Palmer, wrote "I replaced the displaced fourth dorsal vertebra by one move". The way he set about this maneuver on the vertebra was also described. Palmer "racked it into position by using the spinous process as a lever". He emphasized that this was not haphazard, "there was nothing crude about this adjustment; it was specific". Palmer's adjustment was devised to move a vertebra back into alignment in a very specific and precise manner and relied on applying pressure directly onto the vertebra. Early Chiropractic was built up on the premise that displaced spinal bones pressed on nerves causing pain elsewhere in the body and disease of the organs the nerves supplied. It was thought that bones quite readily moved "out of place" and that the adjustment created a cracking sound as it "popped them back in". In fact, modern scientific understanding has shown us that this isn't quite the whole story. The function of a joint is to move two bones in relation to each other under muscular action. The muscles act, when they receive impulses, through nerves that arise in the spinal cord. The vertebral joints are like most other joints in that they move within defined limits according to muscle activity that is controlled by nerves leaving the spinal cord. Very often injury, postural strains or other factors can irritate sensitive joint capsules that retain the lubricant that bathes the joint. A protective response is triggered that sends messages to muscles that control the joint, causing them to contract. The effect is to limit movement that might provoke more pain. This mechanism can also be triggered by injury or strain to other parts of the vertebral joint, such as its ligaments, disc, nerve, bone and even its own muscles. So, any strain or injury to the joint or its associated structures may cause a muscle contraction that locks the joint either wholly or partially. That locking can occur with the joint in its neutral "aligned" position or, if muscles selectively contract, out of its neutral position, so the bones appear "out of alignment". The mechanism serves a purpose while the injured tissue is healing by acting as nature's own joint splint. Unfortunately the spinal splinting mechanism can sometimes go wrong and perpetuate itself long beyond the time needed to repair the damaged tissue. The contracting muscle can be so over effective that it compresses its own blood supply, releasing acids that build up and trigger nerve endings into sensing pain, inducing a further protective spasm. A vicious cycle has been completed. In such an area one ligament might be held in stretch while the other on the opposite side remains slack. In time they will respond by lengthening and shortening respectively to balance the forces upon them, perpetuating the "misaligned" appearance. If a set of joints in a region locks up then its neighbors must compensate by increasing their own movement. As they increase their range they become less stable and themselves run the risk of strain or premature wear and tear, "osteoarthritis". When the Chiropractor adjusts a joint he must first take up all the "slack" in the joint so as to control the movement perfectly. There the patient must contribute by relaxing completely to minimize any discomfort. The Chiropractor aims to induce a split-second stretch to the joint capsule and associated muscles and tissue fibers. By taking up the slack, the joint is opened as far as it can voluntarily go, a point referred to by Chiropractors as the "elastic barrier" or "resistance". There is still ample room for the joint to move within its anatomical range, but if the movement is a slow stretch it triggers a natural resistance from the tissues of the joint. The speed of the Chiropractic adjustment is such that joint tissue resistance is not triggered and the elastic barrier is overcome, often producing a joint "crack". The main effect of the rapid stretch is a neurological response, which creates a wave of relaxation within the joint tissues, thereby restoring mobility. In cases where ligaments have physically shortened, the joint will tend to stiffen up again, although usually not to the same extent as before the adjustment. In time, with repeated adjustment at regular intervals, short ligaments will lengthen again, restoring full function to the joint. It was once thought that the bones made the joint-crack as they "popped back into place". Another theory was that the noise came from ligaments as they slapped tissues on being fully stretched. In the late Sixties researchers at Leeds University showed that the pop occurred within the fluids of the joint capsule. The sudden vacuum caused by stretching the joint brings gases out of the fluids in the form of tiny bubbles. As the vacuum increases within the joint fluids, the bubbles come together until they form one sizeable bubble. The next phase occurs as the bubble bursts with a "pop". All this happens painlessly in a fraction of a split second. Although it is an indication that a joint has been adjusted, the "crack" is not essential to the success of the adjustment, as it is the rapid stretch and not the bursting bubble that induces tissue relaxation and increased mobility. Indeed, Chiropractors have devised numerous methods over the years for restoring full mobility, not all of which require the mediation of the classic Chiropractic adjustment. There are instances when the adjustment is not called for, as Daniel Palmer's son, "B.J. ", recognized when he wrote: "It is more important to know when not to adjust than when to adjust". In such cases Chiropractors will use some of their "non-force" techniques to restore movement and function to a faulty joint.